When the presentiment of the sun gives the nature its blue – purple – orange – colours we make our first moves into snow-covered nature of Lapland. 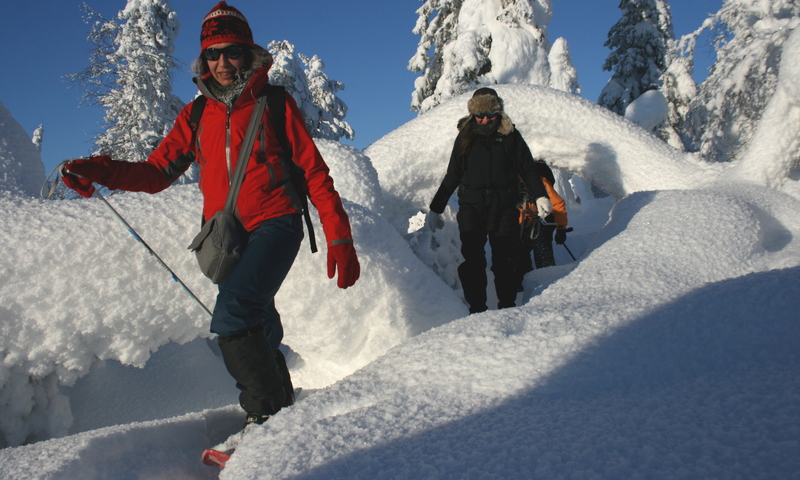 It is the best time for the snowshoe walks in the silent woodland and hilly grounds of the fell area in the Finnish West Lapland. This tour takes us to Finnish West Lapland, Fell areas in the national park of Pallas-Yllästunturi and its surroundings. We start in the middle of the Fell chain area on the shores of Jerisjärvi Lake next to the Pallas-Yllästunturi National Park. Every day we make 11- 16 km tours in varying woodland and fell areas. We reach the fell tops on our way and weather allowing have great views to the surrounding fell and lake areas. We have our breaks in Lappish Tepees (Kota) and modest forest and fell huts. Our overnighting places are well-heated cosy cottages with sauna. Day 1 – Arrival day. Transfer from Kittilä airport to the overnighting place. A short introduction to the coming days’ program. Dinner and overnight stay in cabins or rooms for 2 persons. Day 2 – In the morning we pack our luggage for the transportation. Our route goes along the hilly grounds of Koivakero and Keimiöjävi. After a lunch break we continue more along the Fell Keimiötunturi. The day distance is 15 km. In our overnighting place sauna and dinner. Day 3 – From Keimiö we continue through the woods across the fell of Sammaltunturi taking a lunch break in Mustakero cottage (6 km). After the break, our steps lead us to Lommoltunturi fell and finally to your overnighting place in Pallasjärvi. The day tour is 11 km mostly on the fells. Day 4 – Our destination for today is Harrisaajo. The route goes 11 km in varying forest areas. Lunch break at a wooden Lappish kota (tepee). Day 5 – We make a day tour to the surrounding Fell areas and Rihmakuru, lunch break we make in a kota. Day 6 – Weather permitting we make another day with a breathtaking view from the fell tops. From the Pallastunturi Fells, we go down to the information center of Pallas-Yllästunturi National Park. Our day distance is 13 km. Bus transfer to our starting point at Jerisjärvi Lake where we have dinner and overnight stay. Day 7 – Today we make a day tour to the surrounding forests and hilly grounds. Our route goes via Kesälaki and Mustakero and back. The day distance is 13 km. On Kesälaki lunch break at an open fire in a wooden Lappish Kota (Tepee). In the evening dinner and Sauna. Day 8 – Departure day. After breakfast transfer to Kittilä airport. The day program above applies programs starting on Saturday. On programs starting on Sunday Day 2 program (Kesälaki and Mustakero) will be done on the last activity day (Day 7). The guide speaks Finnish and English. In international groups the main guiding language is English. Language assistance can given also in German and French when needed. The tour is suitable for adults and youth 16 years and older. Accommodation for the first night and two last nights in the base camp Rauhala in a holiday cabins or room for 2-3 persons. During the tour accommodation in wilderness huts and holiday cottages in rooms for 2, 4 or 6 people. Most of the cottages have electricity and running water. Sauna is available every evening.